Your eyes. Your style. Your life. The prescription your doctor writes for you at TSO Kingwood is completely personalized for your eyes. But most progressive lenses are not: they use the same optics for many prescriptions. Your ZEISS Progressive Individual 2 lenses will be designed precisely for your prescription, and manufactured with legendary ZEISS precision for superior performance. You’ll enjoy wide, spacious fields of clear vision – up to 50% larger* than ordinary progressives. The way you use your eyes is unique to you. You may spend more time than most focusing on one main distance (reading, computer work) or your life may emphasize constant refocusing for dynamic activities (driving, sports, gardening). 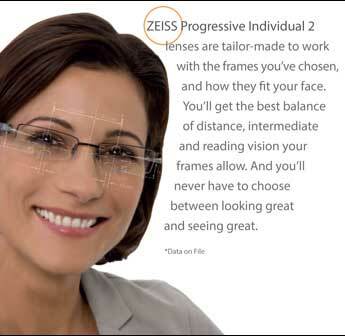 New technology in ZEISS Progressive Individual® 2 lenses allows your eye doctor at Texas State Optical Kingwood to enhance either the near or intermediate and dynamic viewing zones of your lenses to suit your visual lifestyle. You’ll benefit from outstanding vision for all distances, with extra vision support where you need it most. Only select practices have been certified to fit this advanced lens. Trust our experience, knowledge and partnership with TSO in Kingwood, TX to create a Zeiss Individual® 2 lens that is perfect for just one person – you. Ask us today how innovations like Zeiss Individual 2 lenses and PureCoat by ZEISS will allow you to be a part of the ultimate vision experience. All progressive lenses strive to provide a good balance of distance, intermediate, and near viewing zones. But one fixed balance won’t be ideal for every patient’s visual activity profile. Eyefit Technology makes it easy to personalize ZEISS Progressive Individual® 2 lenses to deliver the right balance of near intermediate and distance vision for each patient. All you have to do is specify design option 2I (Intermediate/Dynamic) or 2N (Near) if warranted by the patient’s visual profile.